More specifically, I'm a small business product junkie. Ladies, there are some AMAZING products out there that I've covered consistently on the blog and even shared here on NaturallyCurly. I will always and forever continue to support natural hair small businesses because I believe in them. Not only are the products incredibly unique, well thought out, and crafted with love, but they are made by women (and some men too) who know our hair best -- because they are naturally curly too. They know and understand what ingredients we don't like, and what we want our products to be able to do. And many of them are involved in initiatives beyond natural hair, aimed at making our communities (and world) a better place, like TreLuxe. TreLuxe is a socially conscious natural hair and beauty care brand founded by husband and wife duo Cortney and Kiprono Sigiali. They have focused their brand not only on natural haircare, but on community-based initiatives to educate, support, encourage, and meet the needs of girls and women beyond hair. TreLuxe hair products are designed to give ladies with natural hair a premium upscale product experience, combining wholesome ingredients and Active Botanicals to alleviate our hair woes -- from dryness to curl definition. 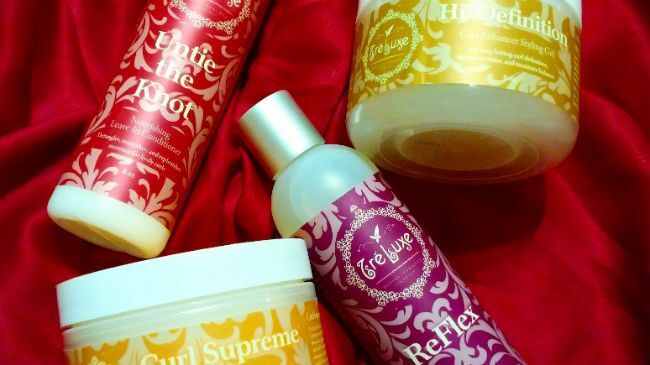 Currently, the TreLuxe line consists of four products -- Untie the Knot Nourishing Leave-In Conditioner, Curl Supreme Styling Cream, ReFlex Curl Styling Serum, and Hi! 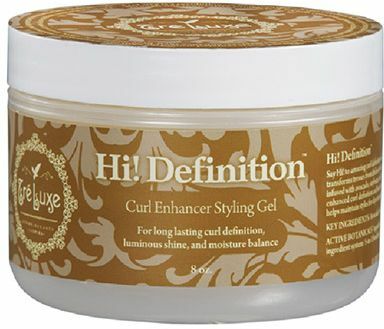 Definition Curl Enhancer Styling Gel. I was too excited to try out the TreLuxe line. So let's get on with the review! Detangles, nourishes, and replenishes moisture for lively curls. Let's face it, Mother Nature can do some serious damage to our precious curls. A constant beating from the elements without the proper protection can leave curls dry, brittle, and vulnerable to complex knots; but, there is hope. Untie the Knot Nourishing Leave-In Conditioner was designed with you in mind! The naturally based conditioner formulated with coconut milk, slippery elm, and olive extract allows for ease of detangling while moisturizing and softening every strand of your textured tresses. The formula is reinforced with a combination of avocado and broccoli seed oils to smooth hair and seal the cuticle, helping to maintain healthy curls and coils. Avoid the damage that Mother Nature never intended! Propylene Glycol: humectant and conditioning agent, often mistakenly attributed to being carcinogenic. It has no links to cancer or any other illnesses. One of the first things I noticed about Untie the Knot is the fragrance, and how totally appropriate it is for the coming fall and winter months. The fragrance is reminiscent of those sweet, warming apple, sugar, and pumpkin spiced candles that roll out at places like Bath and Body Works and Yankee Candle around this time of year. Just smelling it makes me feel all warm and fuzzy inside. Even if the fragrance isn't your cup of tea, it doesn't linger or conflict with other product scents. The leave-in is rich and lotion-y in consistency, without being greasy or weighing the hair down. For those of you that have tried it, the consistency is similar to Camille Rose Naturals Fresh Curl. What I love about TreLuxe the most (and this leave-in is no exception) is that they work INSTANTLY. When applying the leave-in, my hair felt instantly hydrated, moisurized, and smooth. It helped encourage clumping and curl definition, while harnessing enough slip to glide through tangles and rough patches. I especially appreciate Untie the Knot because it s based in three ingredients my hair LOVES -- coconut oil, avocado oil, and aloe vera. With temperatures dropping (as much as they will in LA anyway), I welcome Untie the Knot with open arms into my fall/winter product rotation. 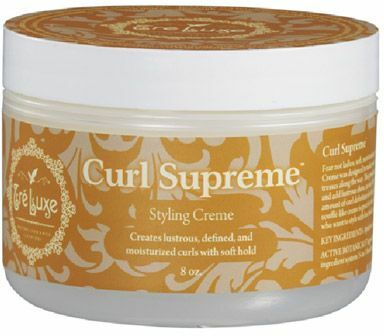 Creates lustrous, defined, and moisturized curls with soft hold. Fear not ladies; moisturized and defined curls are well within reach. Curl Supreme Styling Cream was designed to make your natural curl pattern take center stage, moisturizing your curly tresses along the way. This premium styler is packed with natural oils and extracts to nourish and add lustrous shine, as our 360 Curls Complex regulates moisture and supplies the right amount of curl definition for the job. With just enough hold to maintain your style, this souffle-like creme is great for the coilest textures, as well as for those with moderatey curly hair who want to style with less hold and more moisture. Lactobacillus/Tomato Fruit Ferment Extract: bio-fermented enzyme complex that creates long-term conditioning without buildup. Tomatoes are rich in vitamins, minerals, and a variety of potent phytochemicals. By directly nourishing the hair with essential amino acids, this extract efficiently provides hair the building blocks it needs to form keratin and maintain the hair’s integrity. It can readily penetrate deep into the hair fibre and works in synergy to protect and maintain the hair’s natural integrity and health. When I get excited about a product, I start singing. Today will be no exception. That pretty much sums up how I feel about Curl Supreme. See, I thought I had all my favorite moisturizers/creams locked down. Then Curl Supreme came along and made me re-evaluate my entire life. I'm being dramatic, but I am hard pressed to find anything about this creamy concoction that I don't like. Of all the products in the TreLuxe line, this fragrance is my favorite. It's sweet, floral, and not overbearing. It's thick, rich, and super creamy, and has slip for the ages! Yes, a moisturizing creme wth slip! After applying it, my hair is soft, defined, and intensely hydrated. It works great by itself for a super soft hold, or makes a dreamy moisturizing layer underneath Hi! Definition or ReFlex. I'm ingredient obsessed, so the inclusion of Tomato Fruit Ferment Extract in Curl Supreme and all of the TreLuxe products excites me. It is a relatively undiscussed underutilized ingredient in the natural hair community. I've only seen it pop up in a handful of products from the likes of AG and Briogeo. Call me crazy, but I believe that extract really sets Curl Supreme apart from other moisturizers and curl cremes I've tried. Plenty of products have coconut oil and aloe vera in them. But none have come close to working like this! Creates bouncy, silky, natural curls with flexible hold. ReFlex Curl Styling Serum was created to bring flexible hold to your curly and wavy styles without sacrificing the "bounce" of your curls. Our lightweight liquid styler provides just enough slip to glide through every twist and turn of your tresses, wile adding definition and increasing curl elasticity for those bounce back curls you've been waiting to unleash. Botanical extracts help provide shine and smooth texture to showcase your curls while a coconut water/aloe juice infusion delivers moisture to thirsty curls, keeping them rejuvenated throughout the day. Rice Extract: provides natural UV protection for the hair, while also improving the structural integrity (strength/health) of strands. Keratin Amino Acids: extracted amino acids from keratin that are purified and made more potent, with the ability to penetrate the hair shaft and repair damage, correct porosity issues, and increase sheen and volume. For long lasting curl definition, luminous shine, and moisture balance. Say Hi! to amazing curl definition and bye to pesky friss as Hi! Definition Curl Enhancer Custard transforms tresses from lifeless to luxe in a snap. Our moisture and nutrient rich puree is infused with avocado, soybean, and honey extracts, and is specifically formulated to provide enhanced curl definition and luminous shine with medium hold. Hi! Definition Curl Enhancer helps maintain styles for days instead of hours, giving you confidence in every curl. Carageenan Gum (Seaweed Extract): seaweed common to the Atlantic is boiled to release this compound, which thickens and stabilizes mixtures, keeping them from separating. Polysorbate-60: emulsifying agent that helps to keep water, oils, and extracts from separating. This is love, and yes, those are more Sam Smith lyrics. Yes, yes, a million times yes. Hi! Definition is absolutely amazing. The fragrance can only be described as luxe. I can't call it exactly, but I know I feel fancy every time I smell it. It is custard-esque without being too runny or impossibly thick. Because it isn't super gel-ly or stiff, it mixes well with a wide range of other products -- Curl Supreme included. As a matter of fact, the two make one heck of a wash and go duo. Layering Untie the Knot, Curl Supreme, and Hi! Definition gave me one of the best wash and go's I've ever had to date. See for yourself! This wash and go lasted for days while retaining excellent definition and minimal frizz with no flaking or dryness. A word of caution to those that love to overzealously apply product -- Hi! Definition doesn't require gobs and mounds of product in order to be effective. Apply it liberally, but don't go over the top. One or two quarter-sized amounts per section (depending upon the thickness and length of your hair) applied to wet hair is plenty. As you can see, I thoroughly enjoyed the TreLuxe line of products. My only wish? That they had a shampoo and deep conditioner to go with these wonderful styling products! Hopefully those are in the works. If you are interested in trying products from TreLuxe, be sure to support their newest initiative -- A Natural Fit. TreLuxe has teamed up with Girls with Sole, Girls on the Run, and Girls in the Game to help promote healthy habits and active living among girls in communities that are at-risk for developing health-related illnesses directly correlated to a lack of physical activity. Through these partnerships, the A Natural Fit initiative is designed to support charities that enhance opportunities, build self-esteem, and promote healthy habits among at-risk girls and teenagers. During the month of September, 10% of all sales will go toward the charitable organizations supported by A Natural Fit. You can also donate your rewards points from shopping at discovertreluxe.com to the charities ($5 for every 375 points earned), and work with TreLuxe to host events where the charities directly benefit. For more information on A Natural Fit, click here. To get more information on donating rewards points, click here.